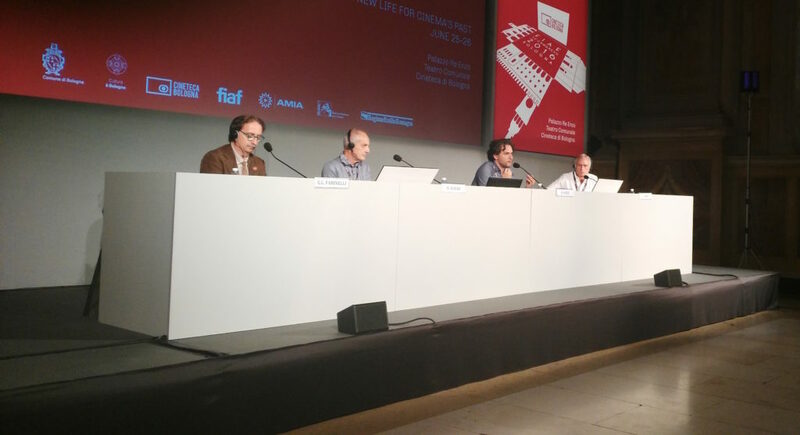 This year during the festival Il Cinema Ritrovato another great event is taking place in Bologna: the 72nd FIAF Congress (22-28 June 2016), hosted by the Cineteca di Bologna. After more than twenty years, the International Federation of Film Archives, dedicated to the preservation of the world’s film heritage since 1938, comes back to Bologna with a unique Symposium program (25-26 June) focusing on one main topic: a new life for cinema’s past. A theme that also runs through the entire festival and that has been leading, over the past few years, Cineteca di Bologna activities and projects in collaboration with the laboratory L’Immagine Ritrovata. The first day of Symposium Congress was an incredible source of inspiration. As stated in the opening lines of the congress’ guide, “film archives have been restoring films for eighty years. A new sensitivity evolved over the course of the twentieth century, and over the past ten years the digital shake-up has changed how film restoration is viewed.” The first session was opened by Gian Luca Farinelli (Cineteca di Bologna), together with Nicola Mazzanti (Cinématèque Royale de Belgique) and Thierry Frémaux (Cannes Classics/Institut Lumière), who lead us on a journey through the history of film restoration, from the very beginning up until nowadays, with special attention to restoration practices in the digital era. Concluding this first session, a round table run by Gian Luca Farinelli, with Grover Crisp (Sony Columbia), Davide Pozzi (L’Immagine Ritrovata) and David Walsh (FIAF Technical Commission), debated the future of film restoration. The future of restoration should always take into account cinema’s past. To Grover Crisp, this means trying not to denaturate the original intent of the filmmaker. To David Walsh, the future of restoration is to recreate a perfect simulation of what was originally shown while converting it into a new technology. If the authentic experience is projecting the film itself, how do we impose elements of authenticity in restored versions? Film experts are needed to work with cinematheques and film archives, not only for commercial purposes, which of course do exist, but more importantly for cultural reasons. Furthermore, Davide Pozzi suggests that the future of film restoration lies in being able to approach classics with a renewed spirit, facing new challenges, but always scientifically, following a “chemin de traduction” (Nicola Mazzanti) as objective as possible. After all, restoration is an open process.